Why do some regions perform better with disadvantaged learners than others? Identified through the analysis of a number of data sources, this research explores the strategies and practices in place at TAFE, private and community education providers who achieve high participation and completion rates with disadvantaged learners. A survey of registered training organisations and case studies found that the most successful strategies were focused around supporting disadvantaged learners needs to be an institutional-wide commitment, building strong relationships with employers and other service agencies within the community and customising the support to the individual. Improving the educational outcomes of the various disadvantaged groups, such as Indigenous Australians, people with a disability, learners with low prior educational attainment and individuals from non-English speaking backgrounds, is a focus of many government policy initiatives centred on social inclusion. This research takes a regional approach to investigate the educational outcomes for disadvantaged groups, to account for variation in the characteristics of local populations, industries, infrastructure and communities, and then identifies effective practices for improving outcomes for disadvantaged learners. The research was conducted in three stages. Firstly, a range of data sources was used to identify regions with both high participation and high completion rates of disadvantaged learners in vocational education and training (VET). Secondly, it reports on a national survey of registered training organisations (RTOs) to determine the strategies used to engage and support disadvantaged learners. Lastly, the research more thoroughly explores the high-performing regions through case studies including public, private and community providers, aiming to better understand why they achieve higher-than-average results with disadvantaged learners. Supporting disadvantaged learners is successful when it is an institution-wide commitment. The institute should have a defined set of initiatives in place, such as providing learning support and matching more experienced staff with high-need learners, rather than relying on ad hoc practices. Building strong relationships with employers and other service agencies in the community is important but requires adequate resourcing. These relationships, which help training providers gain a better understanding of the local community, the types of disadvantaged learners within it, and the available employment and labour market opportunities, enable them to better support their students. While diverse groups of disadvantaged learners are widely offered support, it is necessary to customise the support to the individual, particularly for culturally and linguistically diverse (CALD) learners and learners with low levels of prior educational attainment. Support includes tailored services to the individual’s specific learning needs, such as extra literacy and numeracy support, as well as promoting the benefits of specific outreach programs in the community. The development of regional frameworks that coordinate relationships between local community groups, VET providers and regional labour markets would likely benefit all involved. Collaboration helps to develop a comprehensive and coherent approach to the engagement of disadvantaged learners and may help to strengthen the relationship between VET completion and relevant job opportunities. The vocational education and training (VET) sector in Australia enrols learners from a wide variety of backgrounds in a diverse range of settings, fields of education and programs. As a result, learner participation and success can be uneven. Previous studies have shown that there are large regional variations in VET study across Australia and that regional frameworks provide a useful mechanism for identifying and reporting effective practices and approaches that promote engagement and improve outcomes (see, for example, Walstab & Lamb 2008). It is important to identify the VET providers who are successful in engaging different groups of learners and helping them to complete their education and training so that we can understand and extend the use of good practice. Identifying the most effective practices VET providers use is useful in the context of a national policy agenda which aims to increase the levels of educational attainment of the population (Council of Australian Governments [COAG] 2009). This study draws on national administrative and provider-based survey and interview data to identify effective practices for improving VET participation and learner success. Knowing the types of interventions and activities that work best to engage learners and promote learner success can assist providers to improve the quality of their VET delivery. Better delivery helps VET to work well for all and can assist policymakers to target support for providers, thus raising levels of engagement and completion. Disadvantaged learners1 are defined as Indigenous learners, learners with a disability, learners from a culturally and linguistically diverse (CALD) background, people who are unemployed, or have low levels of prior educational attainment (not having attained Year 12 or an Australian Qualifications Framework [AQF] certificate III or above). The study aims to identify the most effective policies and practices used by providers to improve the participation and outcomes of disadvantaged learners. eight case studies documented instances of strong regional and local practice in the participation and outcomes of disadvantaged learners. The accompanying support documents provide further details on the research process including the theoretical framework, methodology, data collection and analyses. Participation in vocational training varies markedly across regions of Australia. The research uses Australian Bureau of Statistics (ABS; 2011) Statistical Area Level 3 (SA3) as the regional or geographical unit (there are approximately 351 SA3s across Australia). The mean regional participation rate of the adult population in VET in 2014 was 7%, but this varied from a low of 2% in one region to a high of over 17% in another. Some regions have very high rates of participation in VET, particularly for disadvantaged learners. For Indigenous populations the participation rates vary from under 5% to over 40%, depending on the region. For people who are unemployed, the rates of VET participation vary from below 5% to over 50%, and for those with low attainment, from 2% to over 20%. Similar variations occur for award completions, with the rates of completion ranging from below 10% in some regions to over 50% in others, depending on the learner group. Some of the variations in levels of engagement and outcomes are due to features of the regions themselves, such as industry profiles, employment, VET provision, population characteristics and types of learners. However, not all are due to these influences. Some regions achieve comparatively high levels of participation and completion after taking account of these factors, due to the policies and practices employed in the regions. Regression models were used to control for differences in regional characteristics and identify high-performing regions for different groups of disadvantaged learners. Plotting performance in VET participation against VET completion by disadvantaged learners revealed important regional differences. Some regions were able to deliver higher-than-expected participation rates but not completion, while others had low levels of VET participation associated with high completion rates for disadvantaged learners. Importantly, certain regions did well on both participation and completion, after controlling for differences in regional characteristics. The analysis identified 13 regions that achieved high participation and high completion, all else being equal. These regions formed the focus of the case studies. The regions of focus were: Bendigo and Shepparton in Victoria, Albany and the ‘Great South West’ region, and Perth in Western Australia, Huon and Bruny Island in Tasmania, the Yorke Peninsula in South Australia, Rocklea and Acacia Ridge in Queensland, and Lithgow and Mudgee in New South Wales. What practices and policies help some regions to achieve exceptional results, from which other regions might learn? A national online survey of registered training organisations (RTOs) was undertaken in July and August of 2016 to collect information that could help address this question. In total, 994 individual RTOs of the 3704 contacted participated in the national online survey, with 1009 unique respondents. In addition to this, 28 in-depth interviews were conducted with RTOs across 11 of the 13 high-performing regions to help identify the effective practices used with disadvantaged learners at the regional and individual provider levels. These RTOs were a mix of TAFE institutes/universities, community providers and private providers. The interviews were able to flesh out the themes generated by the data and survey analyses and to address the key research questions on effective practices for disadvantaged learners. The results of the survey were mapped against regional performance on participation and completion (the first stage of the study) to show that a combination of course and learner-based strategies are used by training organisations to improve outcomes for disadvantaged learners. customising articulation arrangements to promote employment or further training opportunities. some employed dedicated staff to manage the needs of specific groups of disadvantaged learners. providing intensive course and career guidance. tailoring delivery to learner need and context. adopting a learner-centred approach to provision. VET plays a crucial role in improving the education and work opportunities of disadvantaged Australians. Some regions have succeeded in achieving high levels of participation in and completion by disadvantaged learners, demonstrating that it would be possible for other regions to improve the VET opportunities and outcomes of disadvantaged learners. While some regional differences in economy, population and context account for the performance differences, some regions achieve better-than-expected success as a result of the strategies and practices they adopt, some of which are organised regionally. developing mechanisms for individualised support, taking into account the personal situation and needs of the learner. Regions are an appropriate frame of reference for both analysing VET performance and developing policies, strategies and practices to support disadvantaged learners. Provision is often organised administratively by governments and communities along regional lines. The case studies showed that collaboration between VET providers, external agencies and community networks helps to develop a comprehensive and coherent approach to the engagement of disadvantaged learners. Such collaboration tended to occur amongst the smaller RTOs, both community-owned and private. Community-owned providers had a particularly good understanding of local labour market needs, often through long-term association with the community or locality. They also had reputations for trustworthiness and success in engaging high-need learners. VET providers can make a difference to their local communities when they adopt an institutional commitment to supporting the groups who need it most. Whole-of-staff approaches that take learner circumstances into consideration are critical, as is ensuring that staff are appropriately qualified. 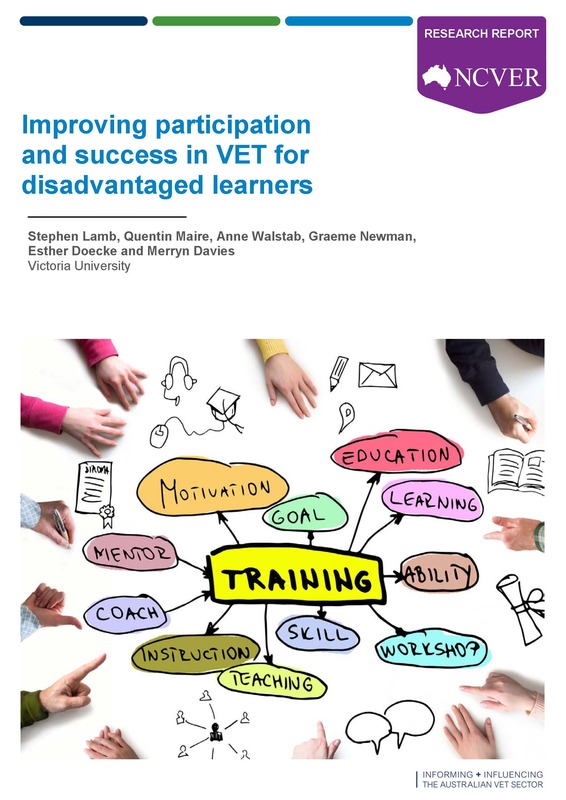 While strategies for improving the participation of disadvantaged learners in VET are not always the same as those that support completion, successful VET providers focus on improving both participation and completion for disadvantaged learners. Disadvantaged learners are not a homogeneous group, and effective VET providers develop tailored strategies for addressing the various forms of disadvantage. For instance, offering a relevant range of basic qualifications can be particularly important for people with low levels of prior educational attainment. 1 These groups were defined by the National VET Equity Advisory Council (NVEAC) and exclude learners from low socio-economic backgrounds who would otherwise be included in the definition of ‘disadvantaged’.